A quick guide to playing Geralt in Soulcalibur VI. Geralt's basic gameplan is to play at "mid-range". His optimal range is right outside that of most characters, but he isn't quite a zoner. He has a bunch of annoying normals and approaches that the enemy has to deal with in neutral, aggravating them, and if they then whiff a move he can capitalize on it very easily. Also, it can make enemies over-eager to "at last" turn the tables, and that is where you use Yrden. He's not an offensive character per se, and not really defensive either (though he has great defensive tools). Rather he's an opportunist. So that means that compared to most of the cast he will have an easier time dealing with rushdown, but struggles against zoners. 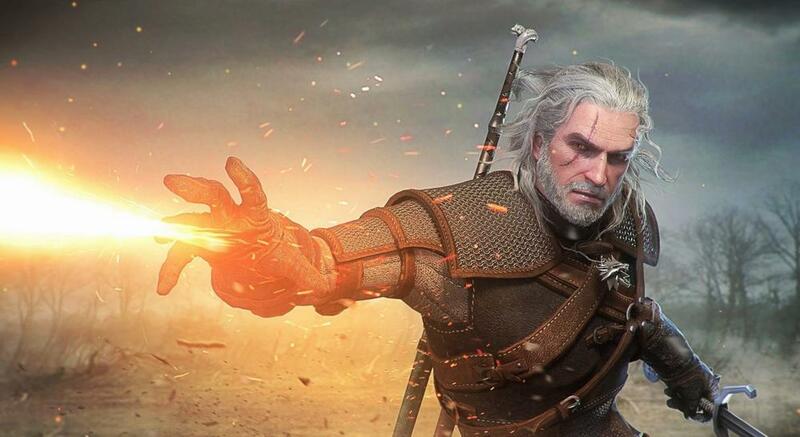 Honestly, simply picking Geralt is going to force opponents to change how they play. They cannot hoard meter against him, or he will lethal hit them with 1AB. So then they're forced to spend it, but they also don't want to Soul Charge, because then he also gets to lethal hit. This means savvy opponents will get pigeonholed into 1) burning meter asap and 2) only burning it on CE which is rarely ideal. In short, he's a very flexible and versatile character. Fighting game players are spread across platforms. There are players on pc, different consoles, and sometimes even arcades. Not to mention there can sometimes be a language barrier. For that reason most fighting games have their own universal notation, and Soulcalibur is no different. Scallywag 93 has a great video that explains it on YouTube, which I embedded below. Check it out if you have no idea what I'm talking about. If you can't read notation, then you won't understand the combos and tips listed here. Or anywhere, for that matter. Geralt is a very simple character, with one of the shortest move lists in the entire game as well as a very simple game plan. This is great because being a guest character, a lot of new players (Witcher fans) will be interested in learning him. And it'll be pretty easy to do so. Overall, Geralt wants to play a mid range game. Further away than most characters like Taki or even Mitsurugi, but not to an extent where you would call him a zoner. Geralt's offense isn't very stellar: he has very little mixups and the ones he does have are very telegraphed. The main thing you want to do is capitalize on your enemies' mistakes. Either by whiff punishing them or using Yrden. The most recommended moves to use are actually the universal tools given to characters. For Geralt these are all pretty baseline. I'm talking about moves such as AA, BB, 2A, 3B, 1K, A+B, and perhaps more that I'm missing. I'm not going over those because that would mean I'm making a guide to Soulcalibur VI. Which I'm not, this is a guide for Geralt. So below you'll find the moves that are good and also set Geralt apart from the rest of the cast. 66A: Super important normal that helps him approach. 66AA is a double high natural combo which advances Geralt, jails, safe on block, and + on hit. 66AB is the first hit of that into Quen, good for yomi after establishing 66A. 66AK is the first into a low kick, good for ending rounds. You'll mostly be using 66AA. 44A: Personally my preferred whiff punish from 8wayrun, at least when close enough. If you're close enough it'll do 60 damage, more than your basic sidestep into 3B combo (though those can do more given enough resources). However it can whiff on crouched opponents since it's a high. 4A: Excellent thing to throw out to catch people stepping and is also a core part of a lot of combos. Make sure you practice the just-frame. 1A: Horizontal low into Aard (1AA), safe against the vast majority of characters. Great for stopping runs. 1AB is punishable but will also lethal hit against characters with a full meter gauge. Both are counterhit combos and both are good for oki. 1B: Vertical low, mostly good for oki but also has its use in neutral. Gives a knockdown and plenty of oki afterwards. Punishable though. 6BB: Super long range whiff punish. If you hold the second B you can burn some meter for extra follow-ups. 33B: Good whiff punish from 8wayrun, gives more follow-ups than 44A but less than 3B. However this has the most range out of all those. 4A+B: Yrden sign. Ridiculous. He wouldn't be NEARLY as good if he didn't have this. This lets you steal turns from your opponent and keep turns that were otherwise lost. A+G: He has insane grab range and good damage on them too. Necessary to make people duck because up close, he doesn't have any good lows. Forward throw can ring out but doesn't come with oki, whereas his other throws do have good oki. One of his side throws can also ring out. If a combo is "fake", meaning it can be air controlled or ukemi'd out of, then I won't list it. 6AB: Good balance between damage and oki. They cannot ukemi this. 6BB: Slightly more damage but worse oki. Slightly better at ringing out. 6B+KB, 44BB: When the enemy is Soul Charged. 6B+KB can also ring out over small walls. 1K: Will ring out to the back-left. Very specific angle. 4A+B (Yrden) - You can sidewalk a lot before doing most of these. 66B+K, 4A:A, 1AA: Standard combo off Yrden. Excellent at ringing out. 66B+K, 4KKB: Less damage and not nearly as good at ringing out. But no need to just frame. 66A+B, 66B+K, 4A:A, 1AA: Spend some more meter for extra 11 damage. Sometimes worth it. 66B+K, 6B+KB: If you need to ring someone out over a small wall. Sidewalk around into 3B: Reverse ring out. B+K, backturned B+KB: Maximum damage but will sideswitch. Doesn't work at the wall. 66BB, 1AA: Less damage but no sideswitch. 4KKA, 6AB: Use at the wall. 66B+K, 4A:A, 1AA: Max damage and good at ringing out. 66B+K, 6B+KB, 44BB: Less damage but gives better oki. 3B: This is the only guaranteed thing you get. 44BB: Less damage but maintains positioning. Geralt’s oki is mostly range dependent. So for example, there is very little after normal throw. 1B will knock down people who block high. 3B into 6AB will knock down people who block low. These two continuously cycle back into one another so long as the enemy does not side ukemi. To beat the side ukemi option you should use 1AA. A+B: Keeps you advantaged on block, lots guard damage. Lethal hit if they GI, but interruptable. 1K: Low option that will also catch ukemis if close enough. Tiny range. 66B+K: Way riskier mid, but also leads into way bigger damage. Good guard dmg. 4B: Mid option to use if they’re in Soul Charge, where it will lethal hit. Safe if held. A+G: Geralt’s close lows are bad, so you need throws to condition people into ducking. 4KKA: Mid option for a wall splat combo. A small note on meter management, as Geralt and Yoshimitsu are the only characters in the game with more options than just Critical Edge and Soul Charge. In short, in my opinion it goes Signs > Soul Charge > Critical Edge. In most cases, obviously not always. 8A+B (Aard) is your fastest move, so there are moves in the game that you can't punish with anything except Aard. 6A+B (Quen) is generally underwhelming, but is especially handy in the Ivy matchup. 66A+B (Armor Melter Igni) is an unblockable that can sometimes be used on oki. Next up is Soul Charge. Soul Charge gives you a bunch of enhanced strings, but they are generally inconsequential. The big benefit is that for ten seconds or so, all your signs become free to use. This includes Igni extensions, Yrden parries, unblockables, meter burned throws, ... Literally everything except ironically, the Critical Edge. Giving you free Aard and Igni is ridiculously strong. You should essentially think of these as a horizontal and a vertical respectively, giving you free reign over the neutral game. This Soul Charge works best when the opponent approaches, so smart opponents will just play defensively. If so, realize that Igni will do a ton of chip damage unless they are good at just-guarding. And finally the Critical Edge. It's a very good whiff punish and Geralt's strongest i16 block punish. The downside is that using it means you give up four Yrden/Igni activations... Considering what you get from the CE compared to four of those, CE is an inefficient use of meter. Though sometimes necessary. Against Seong Mina for example, CE is better than usual. Definitely not Geralt's forte. Most of his punishes are unimpressive. The good stuff starts at -18, and still costs meter. Attacks starting from back or forward (4 or 6) can also be done from crouch.